Producers of animal feed all know a simple truth: when processing cereal grains for animal feed, finished particle size matters. A lot. Blendability, and digestibility – even the economics of feed production – are all affected by the finished particle size of the grains. But this is not a one-size-fits-all situation.¹ The ideal finished particle size varies by the grain being processed, and depending on the species, the life stage of the animal.² With all of this in mind, selecting the proper method of size reduction is a critical decision. A hammer mill is essentially a steel box surrounding a rotor. Swinging hammers attached to the rotor, flail out when the rotor spins. A screen covers the discharge opening to regulate the finished particle size. As material enters the hammer mill, it is pulverized by a combination of hammer blows, particle on particle contact, and impact with the walls of the hammer mill. The material remains in the grinding chamber until it is able to pass through the screen covering the discharge area. But those are just the basics. There are myriad styles of hammer mills: industrial mills, full circle screen hammer mills, horizontal grinders, tub grinders, and more. 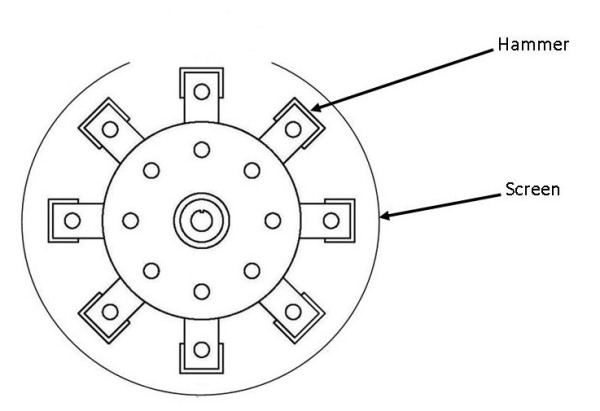 As for size, hammer mills can range in size from 6” to more than 60” rotor widths. Choosing the right hammer mill for your purposes depends greatly upon the material you are processing, and your production goals. With swine operations reporting that up to 75% of their budget is allocated for feed production,³ the need for energy efficiency cannot be overstated. The greater screen coverage of the full circle mill means that there is more area for the material to evacuate the grinding chamber. As a result, a higher throughput rate can be achieved at a lower horsepower in comparison to industrial hammer mill models. The primary factor determining finished particle size is the measurement of the perforations in the screen covering the discharge area. The size of these perforations is equal to the maximum finished particle size of the material processed. The ideal particle size range of 650 to 750 microns³ can easily and consistently be achieved through proper screen selection. In addition, screens can easily be changed to accommodate the processing goals of a variety of grains using the same hammer mill. The secondary factor in determining finished particle size if the speed of the hammer mill. When the rotor spins, the hammers flail out and impact the material with great severity causing it to break down. As a result, the higher the rotor speed, the greater the number of hammer mill blows, and thus a finer end product. An optional component for the full circle screen hammer mill is a variable frequency drive electrical control. This control panel allows the operator to raise or lower the rotor speed as needed for different applications. 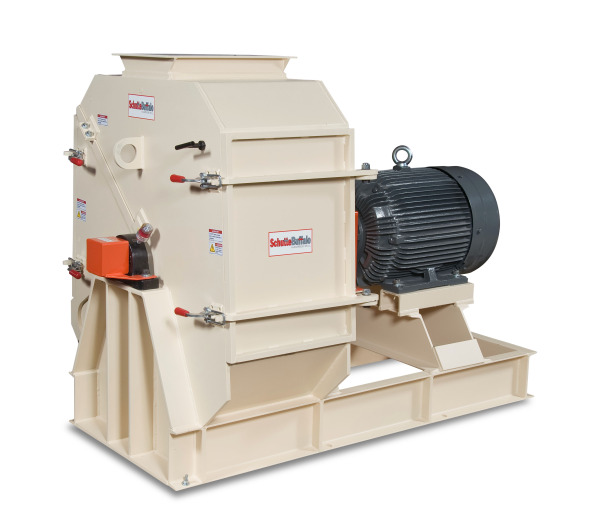 The pulverizing action of the hammer mill produces a finished particle that is easily blendable. The nearly 360 degree screen coverage of the full circle screen hammer mill allows for the greatest throughput to horsepower ratio of all hammer mill designs. A consistent and precise finished particle size can be achieved by screen selection. Finally, the ability to change screen size, and the option of a variable speed frequency drive control, enable processing a variety of grains using the same hammer mill. Size reduction equipment comes in a wide variety of shapes and sizes: vertical or horizontal hammer mills, jaw crushers, roller mills and ram-fed grinders, just to name a few. For the most part, the size and shape of the mill/grinder/crusher plays a key role in the functionality of the machine, and for the applications it is best suited for. Nowhere is this truer than with the Full Circle Screen Hammer Mill. 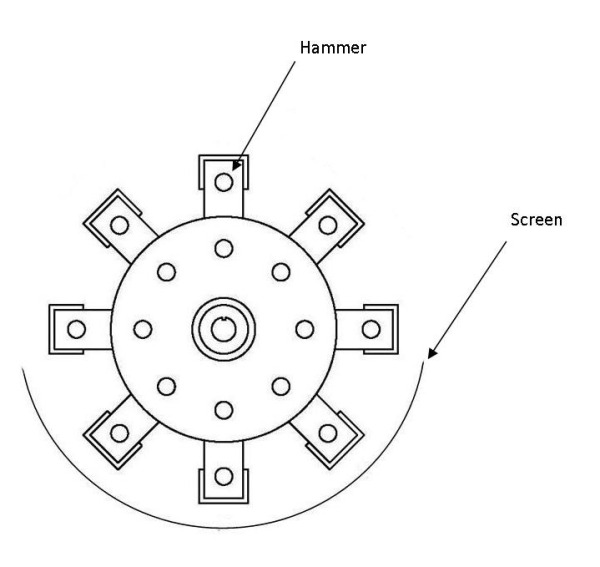 The full circle screen hammer mill gets its name from the 300 degree screen coverage of the rotor, while all other styles of hammer mills typically have closer to 180 degree coverage of the rotor. To achieve the circular, nearly full coverage of the rotor requires that the screen be somewhat pliable, and therefore relatively thin. In addition, the full circle screen mills use thin, notched hammers that reduce material with a tearing/grinding action, as opposed to the pulverizing effect of the large, heavy hammers often used in the industrial hammer mills. As a result, the full circle mills are best suited for light, easy to grind materials that do not require initial grinding against a breaker plate. When material enters the grinding chamber, it is repeatedly struck by hammers that flail out as the shaft spins. A combination of these hammer blows, particle on particle impact, and impact with the walls of the grinding chamber all work together to break the material down. The material remains in the grinding chamber until it is reduced to a size that will pass through the screen. 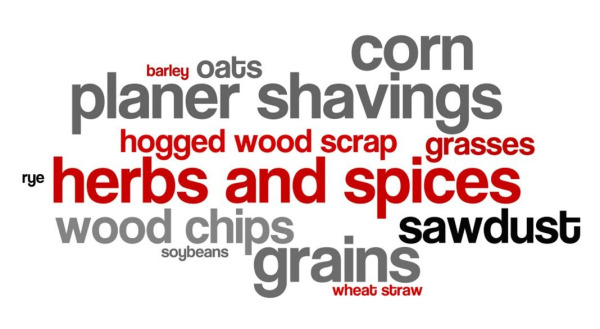 Desired finished particle size - Sawdust, granules, coarse or fine powder? 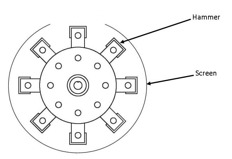 Hammer mill size - Rotor diameter and internal mill width. Screens - Style and thickness of screen, and size of openings. How will the material be taken from the mill? Gravity, air assist, or full air evacuation?